I think I’m going to start recording my daily conversations. haha. I have some great ones and they’d make for some great blog posts. Sad thing is though…I can’t remember their details when it comes time to write a post for the blog. haha I’m cursed with the gift of gab and the loss of memory. Sunday I had to drive BigBear up to the Veterans hospital in Salem to get him checked out regarding a minor procedure he had last week. I was in a pretty talkative mood and I talked his poor ear off for the entire drive; two hours up there and two hours back. “How can you have nothing to write about when it’s time to blog, but you can just talk and talk about everything for hours?” — yeah… sorry honey, I can’t answer that. :). We talked about everything, including where we would love to live, our views on religion and my goal of full time blogging. Oh and speaking of where we would love to live… get this. Big Bear is totally against moving away from the little town we live in. The North Shore — Oahu, Hawaii. EXCUSE ME SIR. haha ok, so my dream of living in Wilmington, NC (which is 4 hours away) is “kinda crazy” but you’re dreaming about packing us up and shipping off to the other side of the world? The Flavor Bible. I like it. I’ve only gotten to read a few pages of it but I like it so far. 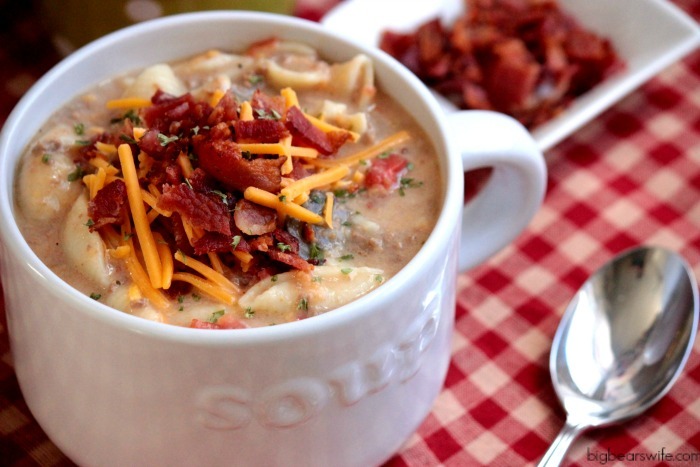 But what about this Slow Cooker Bacon Cheeseburger Soup? Yes, the soup! 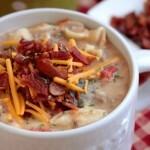 I actually thought about making this soup because I saw a Bacon Cheeseburger Salad on Karly’s blog (Buns in My Oven)! It looked amazing, but since we all know that I have a love hate relationship with salads, I was trying to think of something I could make with the same theme that would be perfect for BigBear and I.
That’s when I started working on a Slow Cooker Bacon Cheeseburger Soup. Cook the bacon until crispy. I normally cook my bacon in the oven at 425F for about 25 minutes. Once cooked, drained and cooled, chop the bacon into bacon bits. Set aside. In a large skillet, add the ground beef and sprinkle with the garlic powder, onion powder, salt and pepper. Cook over medium-high heat until browned, breaking up the beef with a wooden spoon as it cooks. Drain grease if necessary. Add in the tomatoes (with the juice), water and chicken broth. Stir. Add in the bacon and mushrooms. Stir. In a medium bowl, whisk together the heavy cream and corn starch. Add in the cheese and stir. Cook on low for 30 minutes. While that\'s cooking, bring a large pot of salted water to a boil. Add in the pasta and cook for about 12 minutes. Drain and add to slow cooker. Gently stir. Serve Hot with cheese and bacon on top of each bowl. **NOTE - This thickens ALOT when cooled and kept in the fridge. I normally reheat with a little water or chicken broth. Road trips are the perfect place to talk. Sometimes I think we should plan to just drive an hour and turn around just to have a few moments of each other! Speaking of which, I just had my tooth pulled and this soup is looking mighty fine! I’m pretty much the same way…lots to say but when it comes to writing it down I’m at a loss. Great recipe! I know that feeling of staring at the computer with nothing to say! I’ve started making notes in my phone whenever ideas spring to mind. This soup is something my family would love! I definitely know what you mean – some days I’m totally inspired with a story and other days – not so much! This soup looks fantastic! I’d love a big bowl of it right now! I am all for moving to Hawaii!!! Maui is my favorite 🙂 This soup? Amazing! I am the same way – I get writer’s block when I go to actually type a post. Oh well! This soup is torturing me right now because I want it so bad but don’t have all the ingredients! Having just gotten back from Hawaii, I fully support that move! Anyway, delicious looking soup. Wish I had it for dinner tonight. So, one day, when we meet in person, I hope to see you with one of those micro recording machines! 😉 ha ha ha, that would seriously give me a good giggle. This soup sounds so good, and so perfect for this snowy day we’re having. And funny that you should mention The Flavor Bible, as I’ve been pouring over a copy lately, and I just got The Vegetarian Flavor Bible, too. I’d be in for Hawaii too! I can never get enough soup and this looks like a great one to try! The soup sounds amazing, of course. I mean, it’s bacon. And cheeseburger! If Hawaii wasn’t so far away I swear I would move there. BUT the long flight and time change really affected me last time I was there so I’m boring and stick close to home…haha. I do love the look of this slow cooker soup. It’s so hearty for these cold winter days. I would totally move to Hawaii and I would embrace the SPAM culture there…..maybe. This soup looks absolutely fantastic, I can not WAIT to try it! Made this today. All I can say is it is amazing!!! My husband and I loved it. I didn’t serve it with anything because it is a very filling meal all on it’s own. 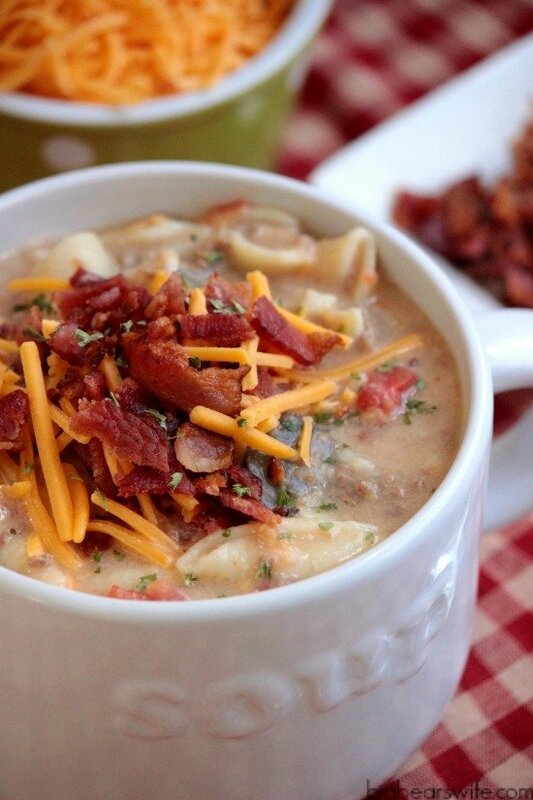 This bacon cheeseburger soup recipe is incredible! I need to add bell pepper to recipe and it would be perfect. Thx for sharing, Angie! I bet it would be great with a bell pepper! 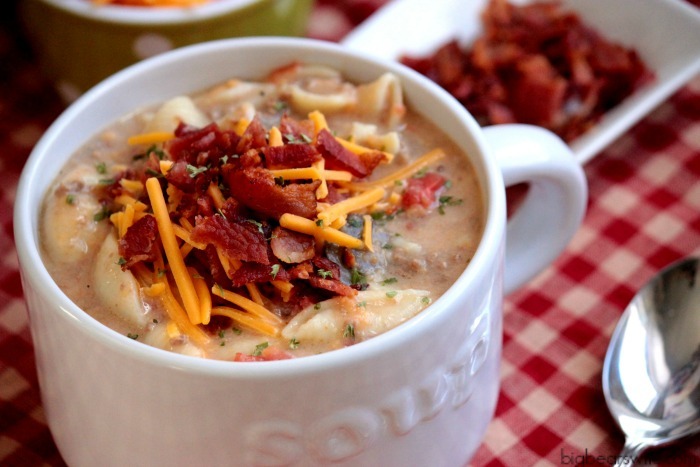 This bacon cheeseburger soup looks so zesty and tasty! Absolutely love your creative idea! Thanks for sharing!